April 9-10, Skirmish at Fort Gaines, Creek Indian/Frontier Historical Reenactment, Frontier Village, 100 Bluff St. South, Fort Gaines, Ga.
Frontier Camp open 10:00am - 5:00pm EST both days, battles at 2:00pm both days. Friends! We organize the event in Poland. On the occasion of the anniversary of the Declaration of Independence. The event will be 24 - 26 June. Main theme are Tadeusz Kosciuszko, Pulaski and others Poles in America. We want to show the battle between the British and the Americans from time of American Revolution. 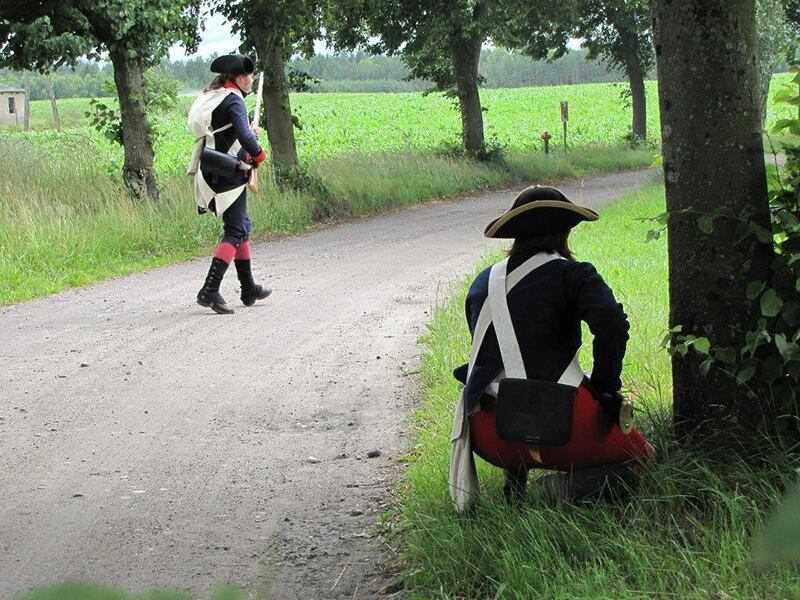 In Poland we Have a small group of continental infantry, small group of trappers and Indians. But its not to much Perhaps you would be interested in coming to us? The Battle of Guilford Court House was a battle fought on March 15, 1781, at a site which is now in Greensboro, the county seat of Guilford County, North Carolina, during the American Revolutionary War. A 2,100-man British force under the command of Lieutenant General Charles Cornwallis defeated Major General Nathanael Greene's 4,500 Americans. 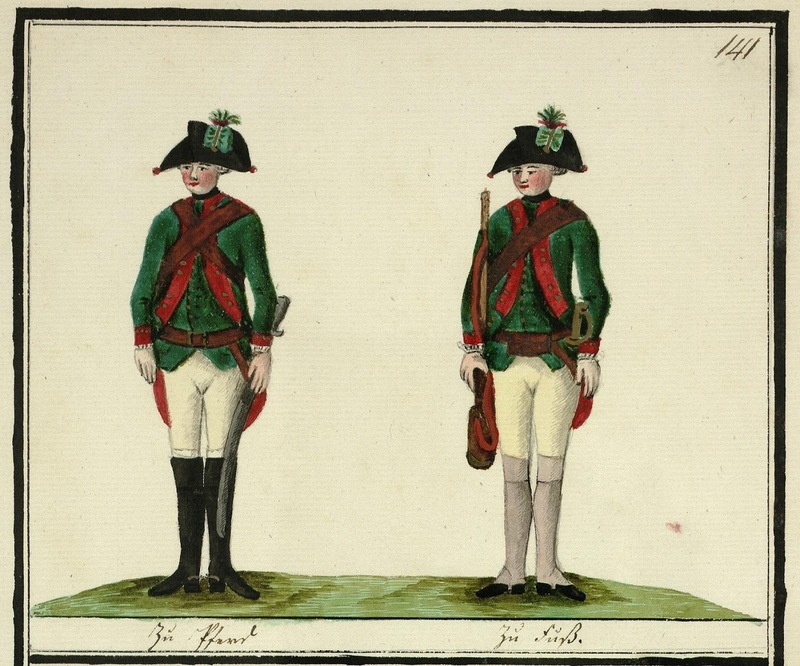 The British Army, however, lost a considerable number of men during the battle with estimates as high as 27%. Such heavy British casualties resulted in a strategic victory for the Americans. The 1758 Battle on Snowshoes occurred on March 13, 1758, during the French and Indian War. It was fought by members of British Ranger companies led by Robert Rogers against French troops and Indians allied to France. The battle took place near Lake George, now in northern New York, but then in the frontier area between the British province of New York and the French province of Canada. The battle was given its name because the British combatants were wearing snowshoes. Rogers led a band of about 180 rangers and regulars out to scout French positions. The French commander at Fort Carillon had been alerted to their movement, and sent a force consisting mostly of Indians to meet them. In fierce fighting, the British troop was decimated, with more than 120 casualties. The French believed that Rogers was killed in this action, as he was forced to abandon his regimental jacket, which contained his commission papers, during his escape from the scene. This battle gave rise to the tale that Rogers escaped capture by sliding 400 feet (120 m) down a rockface to the frozen surface of Lake George. That rock is now known as Rogers Rock or Rogers Slide. 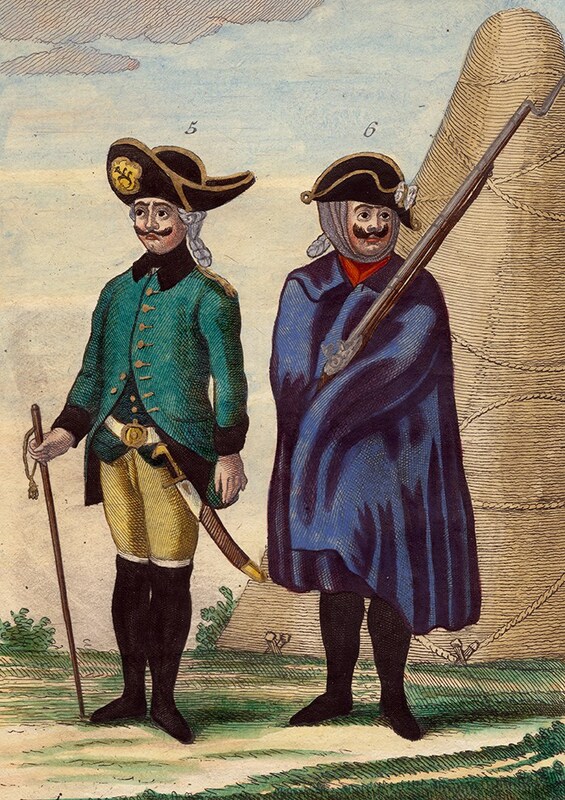 Johann von Ewald was a German military officer from Hesse-Kassel whose military experience spanned the Seven Years War through the Napoleonic Era. 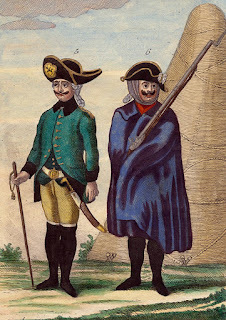 After first serving in the Seven Years' War, he was the commander of the Jäger corps of the Hessian Leib Infantry Regiment attached to British forces in the American Revolutionary War. From the Battle of White Plains until Yorktown, his units fought constantly against the Continental forces. 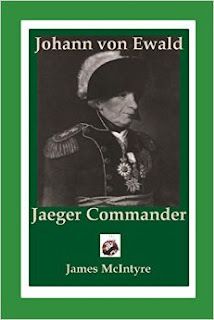 In 1788, he joined the Danish Army, where he rose to the rank of lieutenant general; he also served as governor general of Holstein during the Napoleonic Wars. Following his American war experiences, he wrote an Essay on Partisan Warfare (German: Über den kleinen Krieg), a widely read treatise on guerrilla warfare. He also kept a journal during most of his time in North America that has since become a valuable resource for historians of the war. This book will examine the career of this leader of light infantry troops and his influence on their development. It relies on several rarely seen manuscripts and papers to give the most complete picture of von Ewald available in English. The Ansbach and Bayreuth regiments are remembered for a mutiny that occurred in Ochsenfurt. The soldiers were loaded onto boats on the Main River, but could not cross the bridge, which the Bishop of Würzburg, Adam Friedrich von Seinsheim, refused to open. In addition, the soldiers were forced to stand through the night in the over-crowded boats. In the morning, 8 March 1777 some Ansbach soldiers managed to get to the bank of the river, and pulled the other boats to land. 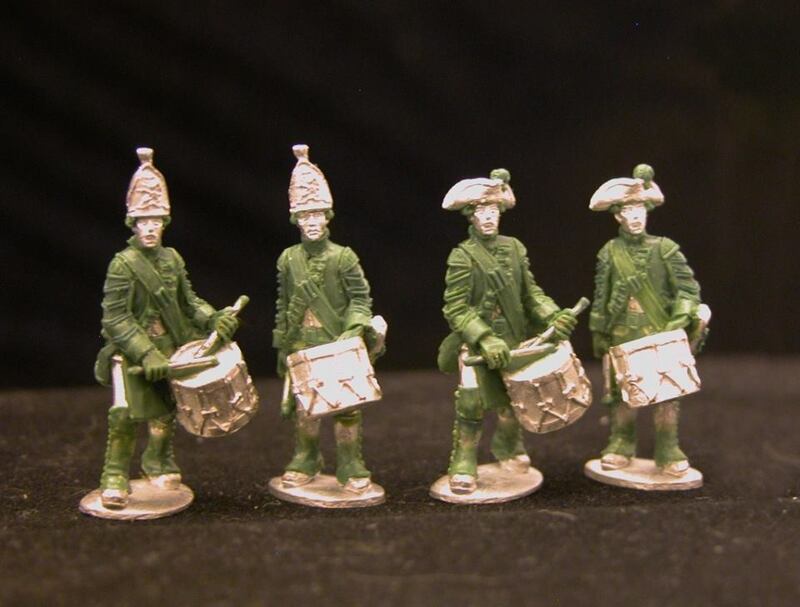 Wine merchants from Ochsenfurt soon arrived and sold beverages to the soldiers. The officers tried to address their concerns, but some men deserted. Chasseurs were posted to keep men from deserting, and fired warning shots; the mutineers returned fire. When the Margrave of Ansbach received word of the riot, he rode through the night to get to Ochsenfurt. The Margrave convinced his soldiers to reboard the boats, and provided two additional boats to alleviate crowding. The Margrave sailed with them as far as Mainz, where he succeeded in getting a bridge opened in that city, without the consent of the Elector, Friedrich Karl Joseph von Erthal. 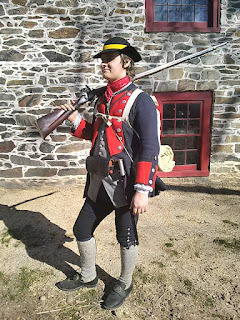 A member of the New Jersey Provincials (Jersey Blues) as they would have looked in the summer of 1758.- from the Old Barracks FB page. 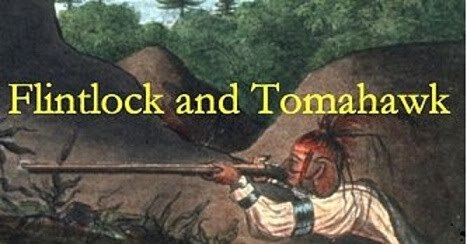 Join us as we journey back to the 1760’s, a time just before the American Revolution, when New Jersey was embroiled in another earlier conflict known as the French and Indian War. 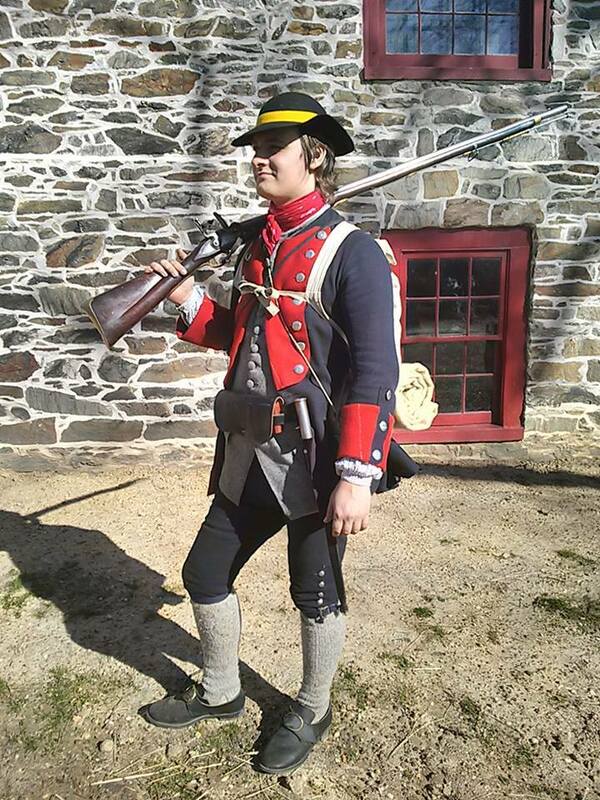 Come see first-hand what military life was like in the colonies during times of loyalty to the King of England. Visitors are invited to experience the excitement of a garrison town after a long winter, as the troops would have prepared to move back into battle. Supplemental activities throughout the day will include morning roll call, musket demonstrations, and presentations by George Bray on the British expedition to take Fort Frontenac by the Jersey Blues. Children are invited to make their own powderhorn, learn how to write with a quill pen, and try on the uniforms of 18th century soldiers. Included in regular cost of admission: $8-Adults, $6-Seniors/Students, Free-Children 5 and under/Active Military/Members of the Old Barracks Association. Parking for this weekend is free and conveniently located in the small lot directly next to the museum. From an article in Czech by Vitous.